Here’s the second batch of ten projects. 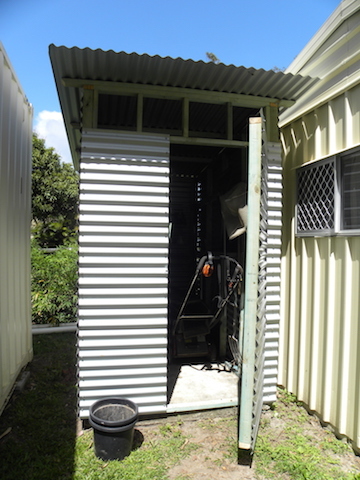 This project started out to be an outdoor bathroom/toilet but the structure just didn’t do it for me – so it became someplace to store our garden tools and equipment. I can honestly say that I had nothing to do with the emergence of this idea. I just got the instruction to build it. 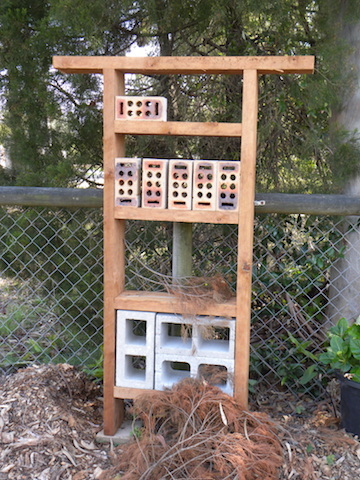 The intention, it seems, is to provide a habitat for beneficial insects. I’m still engaged in the search for infill material…like short lengths of bamboo and anything else that has small holes in it…before the tiny inhabitants can take up residence in the motel. We grow fish, make compost and keep worms so we have the ingredients for some very useful organic fertilisers and soil ammendments. A compost brewer is a simple stirring device that mixes and aerates water in which beneficial organisms are being grown. Prior to doing this project, I could only catch the rainfall from one side of the house. This simple system, comprising a barrel, a sump pump and some hose, allows me to divert rainfall from the other side to the storage tank. 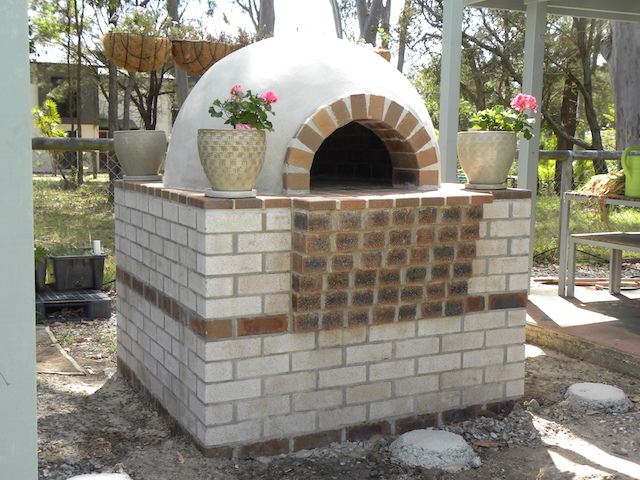 While I’m 5th generation Australian, my food preferences have their origins in Italy, France and Greece – and a wood-fired oven has been a goal that I’ve harboured for many years…..so I got one built. Firewood is the upside of the building activity that is happening on the island on which I live….and pizza, bread and all manner of roasted meats and vegetables are a good way to deal with a glut of firewood. I’ve been so busy that the new oven has yet to experience its first firing. I’m looking forward to it and the learning journey that its mastery will require. While my favourite integrated aquaculture system is the integrated aqua-vegeculture system (iAVS), I’ve had the components for this system for about five years – and I created the design prior to that – so it’s particularly satisfying to see an enduring example of procrastination finally completed. Prior to my introduction to the iAVs, my system builds reflected my commitment to dedicated mechanical and biological filtration and this one is no different. Where it does differ from past builds is that it features an integrated aerobic digester. 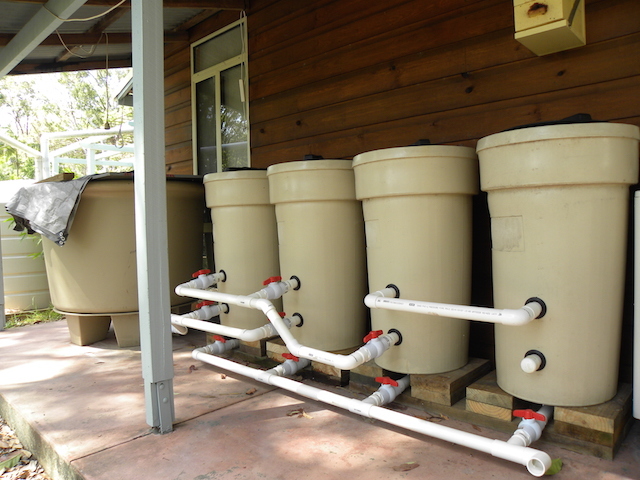 The microFish Farm 2.0 comprises a 1000 litre fish tank, a radial flow separator, packed media filter, moving bed bio-reactor and an aerobic digester (each of around 200 litres). It will integrate with virtually any hydroponic plant-growing system – and it partners well with soil-based ones, too. This is the system that I should have assembled at the time that I built the microFish Farm Lite. With the benefit of hindsight, I would be several hours and 100 jade perch fingerlings in front. 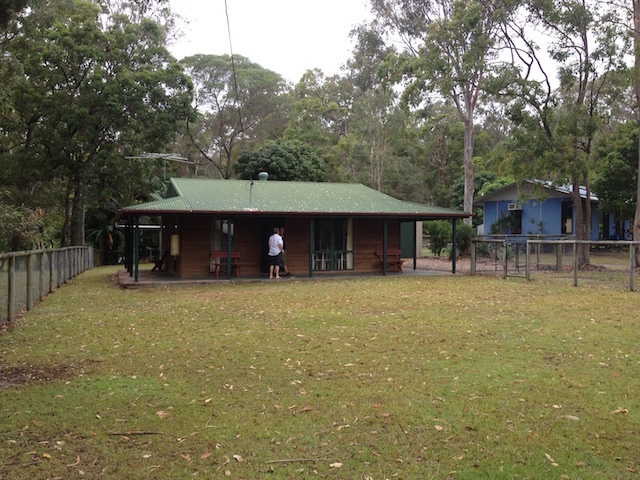 In 2013, we moved from a three bedroom house on 3000 square metres to a one-bedroom cottage on less than a thousand square metres on Macleay Island. While we welcomed the lifestyle change, the local Lions Club were the principal beneficiaries of the de-cluttering that it required. That was my first practical move toward minimalism…simple living. My current living space…and my workspace…is 6m x 4.5 metres (20′ x 15′). That’s only possible if you manage to rid yourself of the surplus clothing, books, electronic gadgetry and all of the other non-essential flotsam that you accumulate as you travel through life. This project, like a number of the others, is a work-in-progress so it’s diffucult to quantify. Arguably, the principal outcome of this de-cluttering project is to confirm that it’s where I want to go. The pergola project sought to soften the interface between the inside and outside of the cottage. 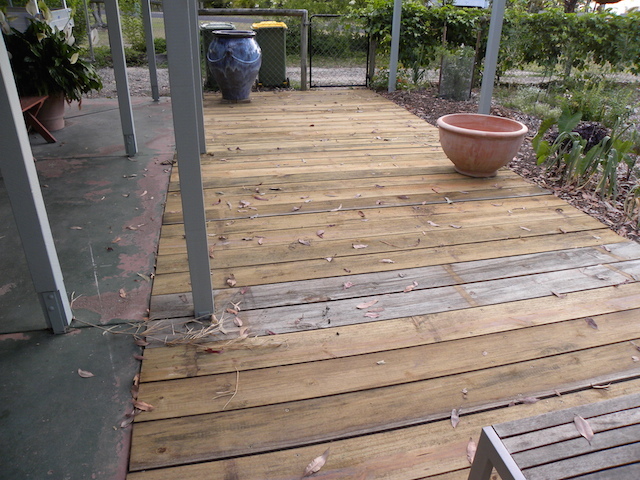 The 300 square feet of decking is an extension of that process. I could have chosen concrete or pavers but the treated pine sleepers provide a boardwalk feel that I feel is appropriate to our island setting. Stockpiling life’s essentials is a hedge against any of life’s exigencies including extended power outages or interruptions to income through sickness, accident or retrenchment……or any situation which places pressure on your financial situation. The creation of a food bank has been on my agenda for a long time and was reinforced by a recent visit to my home state that coincided with a storm that knocked out the entire state’s power supply. I got a first hand look at what happens when the infrastructure that supports a city is taken away. This is what our front yard looked like when we moved onto the island. It looks nice and tidy but not even worms would live in it. We actually commenced this project in late 2015, but the bulk of the work associated with it has happened in the past four months so I’m claiming it as a project. This is what it looks like now. OK… it’s not Monet’s garden – but he didn’t have acid sulphide clay to deal – and it’s slowly getting there. OK… it’s not Monet’s garden – but he didn’t have to deal with acid sulphide clay. 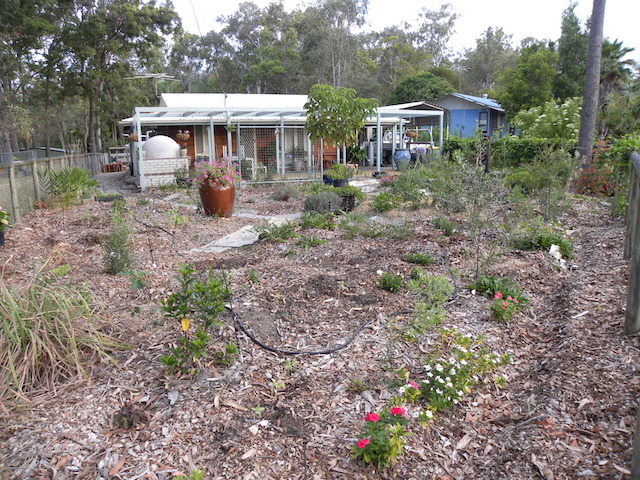 I’m slowly increasing the soil fertility and learning what will grow – and what won’t. I’m still missing a couple of photographs but I’ll insert them when they are available.